Our Love and Prayers to their Families and Friends. On The Hunger Button at This Site, To Help. Thank you, Firelace, for this Ribbon. Til All Our Service Men and Women, Come Home. My Friend, The-Jazzman, sent me these. This is different from my other Site. I wanted to share with all, my Culture & History and how proud & blessed in being who I am and where my Ancestors came from. Also, I have Other's Culture and their History. I am a strong believer in Seeking Knowledge so that I may better understand others, ie, All My Brothers & Sisters. I truly believe that Knowledge and Understanding is the Key in Stopping Racism of Any Kind. I hope that, All, enjoy my Pages and come away with a deeper understanding of one another. After all, We All Are From One Race.."The Human Race". Pretty women wonder where my secret lies. I'm not cute or built to suit a fashion model's size. But when I start to tell them, They think I'm telling lies. I say, It's in the reach of my arms The span of my hips, The stride of my step. The curl of my lips. I walk into a room just as cool as you please. And to a man, the fellows stand or fall down to their knees. Then they swarm around me, A hive of honey bees. I say, It's in the fire in my eyes The flash in my teeth, The swing in my waist And the joy in my feet. Men themselves have wondered What they see in me. They try so much But they can't touch My inner mystery. When I try to show them, They say they still don't see. I say, It's in the arch of my back, The sun of my smile, The ride of my breasts, The grace of my style. Now you understand Just why my head's not bowed. I don't shout or jump about Or have to talk real loud. When you see me passing It ought to make you proud. I say, It's in the click of my heels, The bend of my hair, The palm of my hand, the need of my care. "Please Don't Wait til It's Too Late!! Get out, get help. ~ "Violence isn't Born..It is Learned"
"Petition to Strengthen Domestic Violence Laws"
petition says, and I think you might agree, too. Note: After Viewing Each Page..Hit your Back/Return Key.. 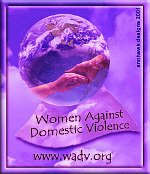 This Purple Ribbon is against all Forms of Abuses and Violence, against Children and Adults. No one has the right, to Hurt another Human Being..No One! !